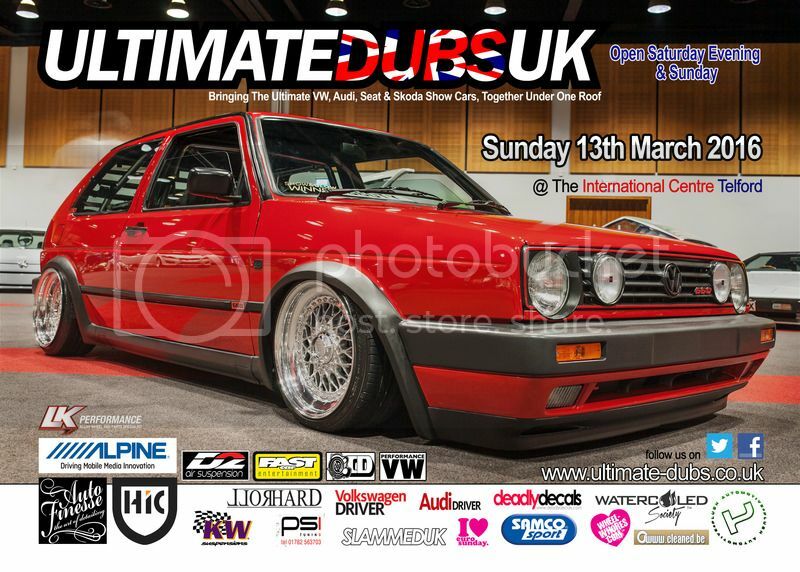 It`s time again to invite you to Ultimate Dubs at the Telford International Centre - UK ‘s largest indoor VAG enthusiast’s event. Each year it brings together the best Ultimate VW, Audi, Seat, Skoda & Porsche show cars for you to view. The show date for 2016 is on Sunday 13th March, however we are open on the Saturday Evening again from 5.30pm. The event will be supported by Local, National and European advertising to host the best show cars, clubs and associated trade companies for everyone to enjoy, with thousands of visitors from across UK, Europe and beyond – the forefront of vehicle perfection. Ultimate Dubs 2016 will display over 500 of the Best Water-cooled VW, Audi, Seat & Skoda show cars from across the U.K and Europe over the weekend at the Telford International Centre and whether you are into Stock, Old Skool, Nu Wave, Custom or Tuned Cars – there’s going to be something to suit everyone at UD16. Don’t forget to visit our shop on site for your UD Merchandise. showroom many years ago! Go back in time and remember the iconic motors. Advanced Tickets are available to purchase via our website, so pop over to buy your tickets today, where you will save some pennies and also beat the queues on the day! Want to show your car at Ultimate Dubs 2016? Do you have a vehicle that you think would be worthy of competing against the best in Europe or fit any of the displays above, then please go to our web site www.ultimate-dubs.co.uk and fill-in the form on the show and shine section so we can get an idea of what you’re vehicles about. All entrants will receive one Free Admission for themselves, and may drive home with one of our Ultimate Trophies. Over 50 Trophies to be awarded to the best in their class. Visit our UD Facebook page for all the latest news from UD. I went for the 1st time last year and really enjoyed the show , am sure this year will be just as good..